Tom Harvey Award Winner 2016 - Website of commday! 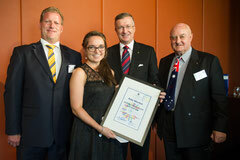 From left to right: David Harvey, Vice President, Australia Youth Trust and Commonwealth Day Council; Dr Kate Murton, Tom Harvey Recipient; Michael Miller RFD, Official Secretary representing the Governor of NSW; and Hon Max Willis RFD ED CSI, President of the Australia Youth Trust. Dr Kate Murton is a Medical Officer with the Hunter New England Health who led a fundraising effort to build an operating theatre in Bahati, Kenya. Through her efforts she has saved many mothers and children from complications during childbirth. The 'Operation Bahati' project continues to raise funds to fund a local doctor for a health clinic staffed by two nurses in South Horr, also in a remote region of Kenya, whose community suffers from chronic respiratory conditions.